When creating their new location in Brooklyn, New York, Bed Bath & Beyond wanted to establish more meaning for the “beyond” portion of their store. The ask was to create a way to enhance and facilitate unparalleled customer service and product discovery to educate customers on everything Bed Bath & Beyond has to offer, whether it’s in or beyond the physical location. 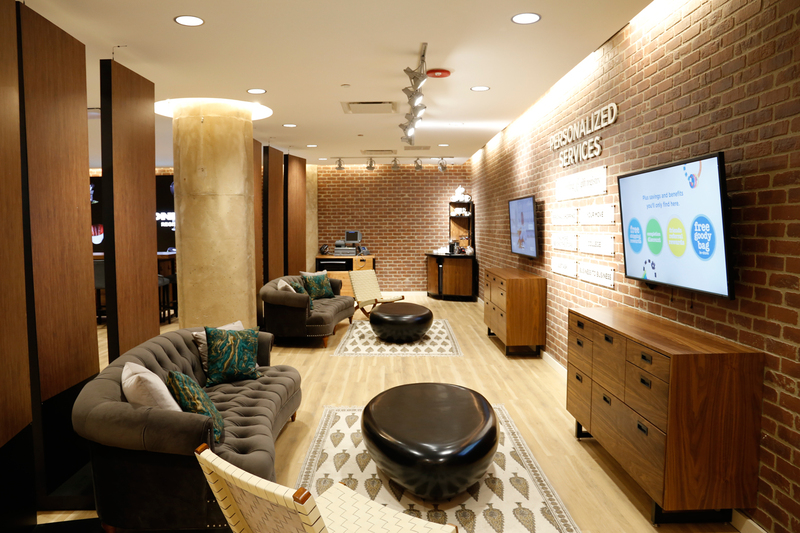 When presented with the assignment, we knew that we had to design a space that was not only beautiful and inviting, but one which acts as a hub for the range of brands owned by Bed Bath & Beyond and exceptional services available. The concept of the BEYOND Room centered on creating awareness of the “Beyond”, which was important in order to expand consumer expectations and drive discovery. Additionally, the space had to feature modular elements so that it could fit the layouts of other Bed Bath & Beyond locations once the BEYOND Room began to expand past the flagship Brooklyn store. A dedicated space with a Brooklyn vibe. 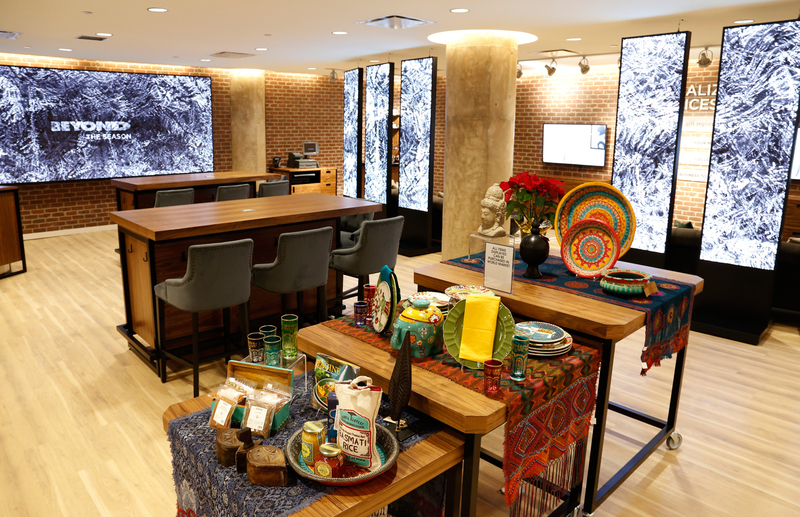 With Outform’s help, Bed Bath & Beyond was able to construct a dedicated space within the store which creates discovery of products and services that go far beyond the store. 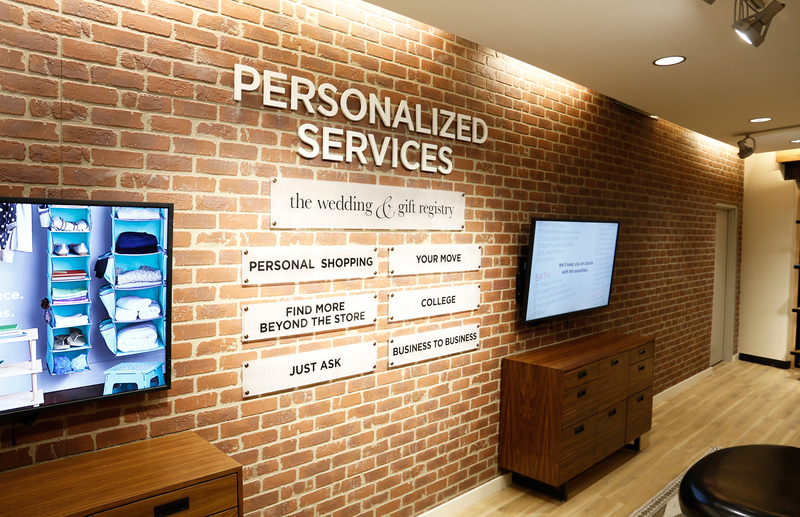 The BEYOND Room is an ideal space for customers to receive personalized shopping services including wedding and gift registry, personal shopping, decorating and design consultations, and explore product information for items not available at the location. 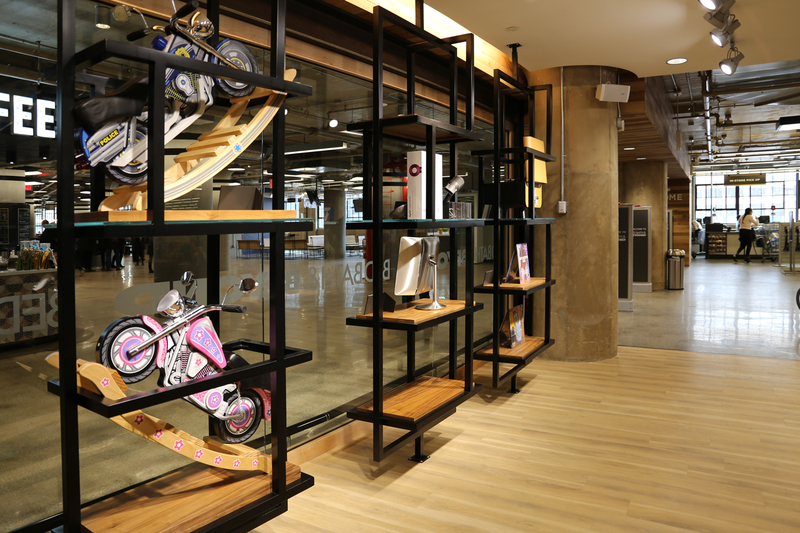 The BEYOND Room’s window display showcases products from the retailer’s wide brand portfolio to give shoppers an idea of what the store has to offer while the open layout creates a laid-back environment that welcomes in guests to explore further. 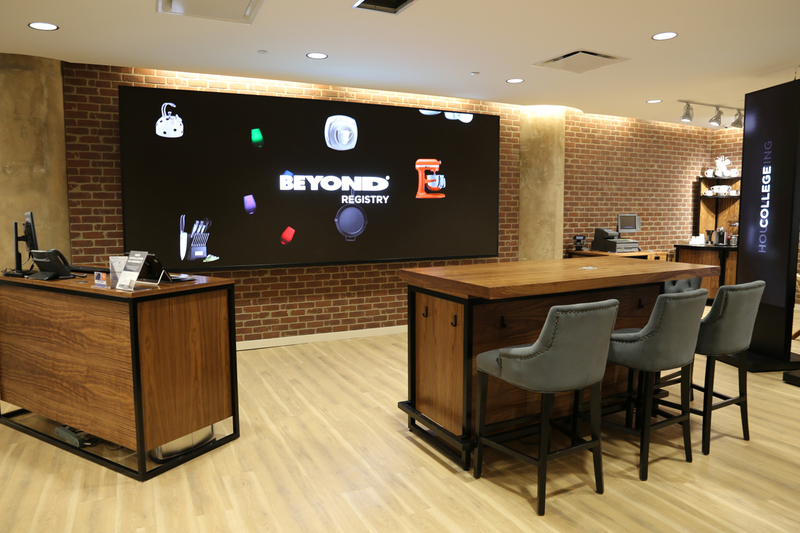 Located at the entrance of the store, The BEYOND Room is instantly noticeable through strategic placement of the impossible-to-miss video messaging screens. An impressive LED screen located at the front of the room, measuring 14′ x 5.5′, accompanied by six LED screen panels create an instant “Wow!” factor and help establish the meaning of “Beyond”. Messaging and images on the screens center around core services, product category extensions, and brand portfolio and are visible before even entering the store to draw shoppers in. Remaining true to the Bed Bath & Beyond brand, the BEYOND Room delivers a neighborly, friendly, and inviting energy through layout, material, color, and structure. The loft-like feel makes it fit in perfectly with the rest of the store, giving it a modern, edgy vibe that is perfect for the Brooklyn area. 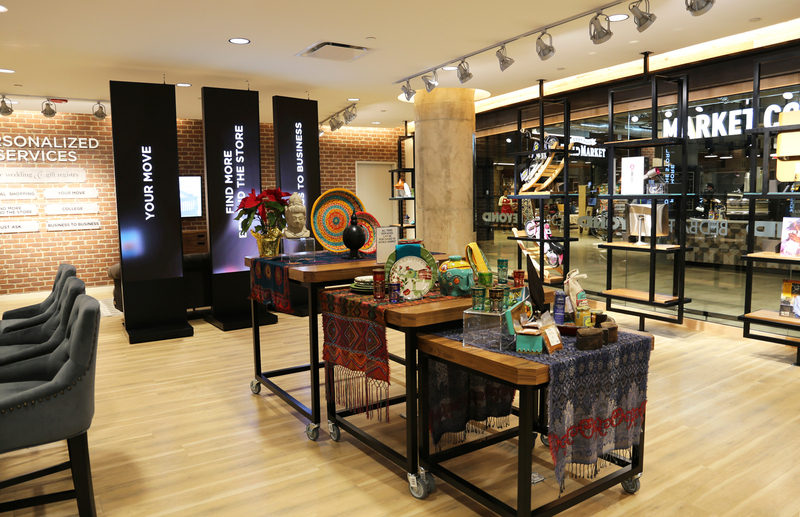 The BEYOND Room came together as a contemporary environment that invites shoppers to explore and engage the Bed Bath & Beyond extensive range of products and services through unique in-store messaging technology, impeccable design, and helpful store representatives.